Another DIY for y'all today! I've been cranking out the projects around the house, so this won't be the last you see on here! We have a beautiful bay window seat in our bedroom, and I wanted to make a cushion for it and spend as little as possible. And I didn't want to use my sewing machine, since that always results in a meltdown. So I came up with a very quick and budget-friendly solution that can be used again when we inevitably move! 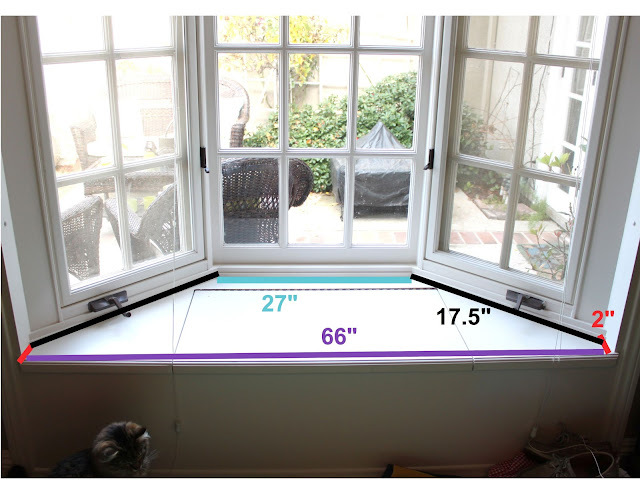 First, measure your window seat! I bought my foam (2" thick) at Joann's. That stuff is expensive! Tip: download the Joann's Fabric app and there is, just about always, a 50% off coupon. I had them cut it to 66" (length) by 23" (width/depth) and then I finished the rest of the cutting at home. Since I have a bay window, the dimensions were a little more complicated. First, I measured the little sides (the red in the picture above) and marked accordingly on each side on the foam. I marked the half way point at the top of the foam (33"), and used that mark as the center of the length of the back of the cushion (I feel like I'm speaking gibberish right now...I hope this is making sense!) The turquoise line (pictured above) is 27", so half of that is 13.5". Using your measuring tape, place 13.5 on the mark that you made for 33" (the middle of the whole cushion). Then mark at each end of the measuring tape. Measure the lines you just made to make sure it's accurate (the black lines above= 17.5") Then, cut! An electric knife is the best tool to use for this, but I couldn't find mine so I just used kitchen shears, and they worked surprisingly well! Now it's time to make it pretty! I chose to not sew for a few reasons. 1) I hate it. 2) It takes me about 12x longer than it should, and 3) I wanted to be able to use this cushion again for our next house, and there's a good chance the dimensions will be completely different. So I ordered a bit of extra fabric, wrapped it like a gift, and safety-pinned it onto the bottom! This way, it's super easy to take on and off and throw in the wash. Plus, if we move and have a bigger window seat, I can just add extra foam and re-use the fabric! I absolutely love how it turned out! And so do the cats...they are up here every time I walk in the room! A few pretty pillows complete the look. This is now one of my favorite little spots in the house! Love it! I did this with our window seat as well, except I added a plywood board with the foam, so that the cushions were a little more sturdy. With my two crazy dogs jumping around all the time, it was definitely needed! Wow looks super easy and I love that you can change the fabrics as much as you want!! Thanks for sharing! Gorgeous...and I'm all for making things as easy as possible. Who needs sewing?! :) And holy gorgeous courtyard!!! Looks great, nice work! Hope your new year is off to a great start!! It looks great. A perfect spot to curl up with a book. you are way too talented missy!! this looks so pretty! miss you! Anyways, I love this DIY and the fabric you chose is beautiful! 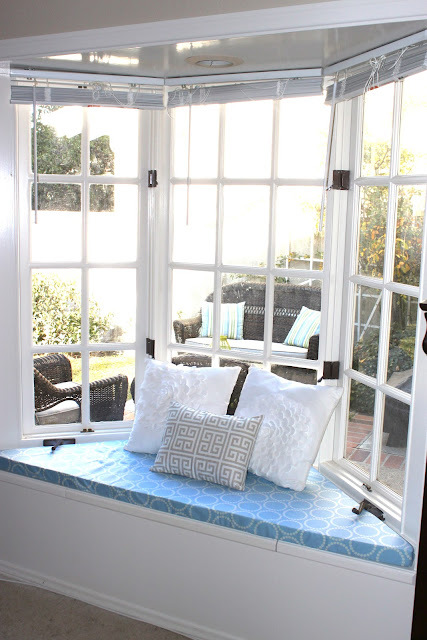 I've got to make a window seat cushion for our house. How expensive was the foam, do you remember? Was it worth it? I was just going to ask you what you used to cut... I can't find my electric knife either.. I think I sent it to the thrift store in a frenzied purge session. Sigh. I'm glad to hear the scissors will work. Off to complete this project FINALLY! Thank you so much for posting this! I am so happy with the way my new window seat turned out! Great idea to use pins! Especially with little ones and a dog too! Easy cleaning and can change out the pattern for holidays or if I just get bored with it! Used a scissors for cutting without a problem also! Thank you so much for this blog. I, too, hate sewing. I just did this and am so happy with it! Great idea! I'm going to do this for my bay. One suggestion: maybe create a paper template for a cutting pattern. Can use newspaper or wrapping paper and tape pieces together to make large enough piece. Also make sure foam thickness doesn't interfere with window handles. Very pretty! Does the cushion slide off when you sit on it? Love the simple idea of pinning...would have never thought of it. I am also curious as to whether the cushions tend to slide? I suppose a sticky mat like those under cutting boards might work for that? You just saved me $250!!!! I had so much fun making my own with your simple instructions :-) Thank you SO much, lots and lots of hugs!!!! Thank you! I was just pricing a custom cushion for my bay window and it was coming close to $300 - yikes! - plus my cats are just gonna barf on it anyway... lol... which actually makes me love this even more, since I can just unpin the fabric and wash it - perfect! 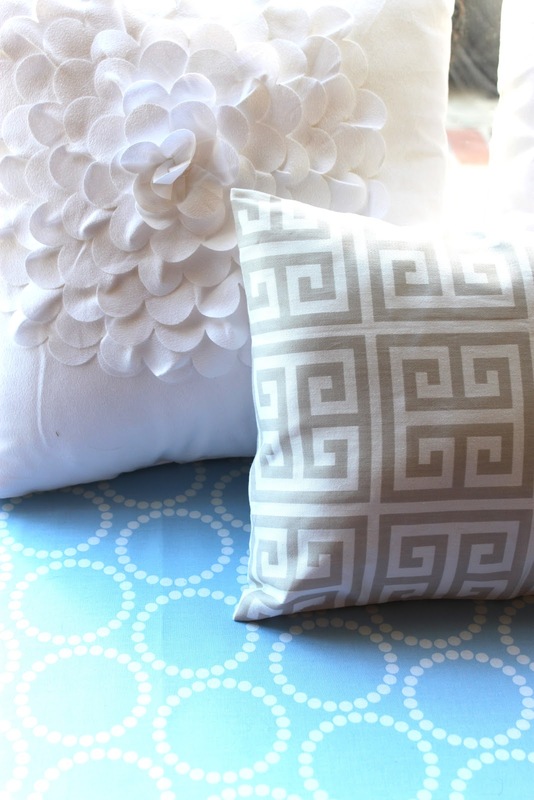 I also love that I can change up the fabric easily (and cheaply) when I redecorate. Genius - thanks so much for posting! 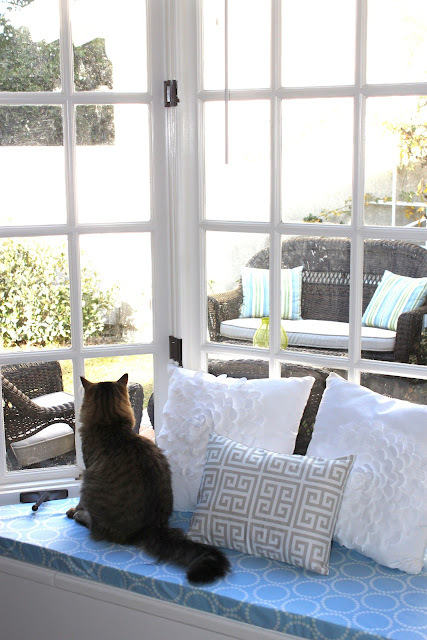 I have wanted to recover my trapezoid shaped window seat cushion for some time now, as the fabric had faded and begun to tear. When I looked into having it replaced by a professional, the cost was more than I was willing to pay. Then I came across your blog and saw what you had done with yours. I too hate to get the sewing machine out and this idea of wrapping the cushion with fabric and securing with safety pins really appealed to me. So I bought 3 yard of fabric and using your photos as a guide, recovered mine yesterday. I couldn't be happier!